Pierre Desrochers is an Associate Professor of Geography at the University of Toronto Mississauga, Hiroko Shimizu is an economist. “Locavores” believe that food produced near final consumers is superior in a myriad of ways to distant imports. While they might disagree among themselves on what exactly constitutes a “local foodshed” (a 100-mile radius or the whole state of California? ), they have for the most part internalized longstanding populist and romantic grievances against modern agricultural science, fossil fuels, large corporations and globalization. 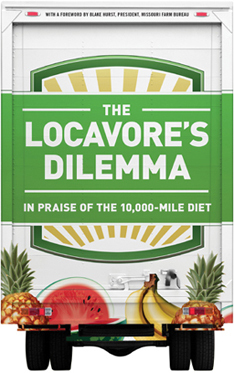 In our book The Locavore’s Dilemma: In Praise of the 10,000-mile Diet (reviewed for this blog by Alex Epstein), we draw on economic logic and basic scientific, geographical and historical facts to illustrate how the long-distance trade in foodstuffs played a critical role in bringing about such positive trends. What the world really needs, we argue, is to get rid of trade barriers, agricultural subsidies and uneconomical and environmentally unsound policies such as the ethanol mandate so that more food can be produced more cheaply in the world’s best locations by ever more efficient farmers. To our surprise, our politically incorrect piece of work received much (and by and large fair) coverage. Of course, many diehard locavores quickly denounced us as paid shills of Monsanto. A prominent Canadian food activist called us “baby killers” to our faces. An anonymous reviewer on Amazon.com was in such a hurry to point out the errors of our ways that she didn’t notice that the book was co-authored. Someone else even accused Hiroko of being a Chinese spy because of a student exchange program she participated in over a quarter of a century ago! To modify somewhat the old legal pun, when you don’t have either logic or facts on your side, fill the comment section of websites with ad hominem attacks. Writing in The American Prospect, Sarah Laskow accuses us of taking a very narrow (i.e., geographical) view of “local food,” whereas to food activists “buying local has mostly been a convenient shorthand for buying food that’s grown in a more broadly sustainable way.” Well, guilty as charged on this one. It is apparently very difficult for an old-school geographer (not to say most dictionaries) to interpret “local” as anything other than something related to a particular place. Of course, one of the main goals of geography as a discipline is precisely to help people understand that no two places are exactly alike. Geographical differences, in turn, give us the opportunity to produce things (whether crops or livestock) more effectively in some areas than others. The result is not only more food for less money, but also significant environmental improvements as long-distance trade has long made it possible to relocate countless productions from less desirable to more desirable locations (say, when grain production was moved from hilly, rocky and erosion-prone terrain to flatter regions endowed with better soils and better climate). Most locavores, it turns out, don’t really want to give up coffee, chocolate and orange juice. And not all of them are romantic luddites – after all, what are urban vertical farms if not revolutionary (despite the fact that the basic concept has been around for something like a century and never profitably acted upon…)! True, we do make the case against going completely loco, but our goal is not to set up a straw man; it is rather to illustrate that less of a bad thing does not make it a good thing. In other words, if most locavores do not want us to drink a whole bucket of arsenic, they nonetheless insist on a few glasses. Moderation in such cases, however, hardly makes for a healthy prescription. "True, we do make the case against going completely loco, but our goal is not to set up a straw man; it is rather to illustrate that less of a bad thing does not make it a good thing. In other words, if most locavores do not want us to drink a whole bucket of arsenic, they nonetheless insist on a few glasses." Truth be told, we did not ignore the role played by these advances, but rather pointed out that “none of the technological advances that made current living standards possible would have taken place in the absence of long-distance trade and urbanization” (p. 146). In short, there can be no economic and scientific development without urbanization; for at least a few millennia, urbanization has been impossible without some significant long-distance trade in foodstuffs; and people need to get off the farm in order to become scientists, engineers, managers and construction workers. Because of their inherently lower productivity and the fact that they require more people to produce food less efficiently, locavorism and subsistence farming can only hinder the development of an ever broader division of labor and thus negatively affect overall standards of living. (Almost) fresh from debating Pierre on the radio (for a third party assessment (here)), locavore activist Jill Richardson published a much quoted piece on AlterNet in which she accuses us of using “arguments from neoliberal economics” that ultimately rest on unrealistic assumptions. Yet, we always insist on presenting ourselves as “policy analysts” because we do not want to be associated with the type of approach decried by Richardson. Suffice it to say here that the academic economist to which our book owes the greatest debt is institutionalist Thomas DeGregori. It is no coincidence that Richardson didn’t provide any direct quote to some unrealistic assumption made in our book, for there aren’t any. At any rate, let’s look at each of her arguments. 1. Assume the players are rational: As Blake Hurst writes in the foreword to our book: “our world is not rational, and most of what passes for thinking about food is as full of air as an elegant French pastry” (p. xiii). Besides, those of us who have had the displeasure of debating Jill Richardson know first-hand that food activists are rarely open to rational arguments. 2. Standardization of food: Richardson argues that goods are different and that standardized goods are typically not as good as local produce in season. We are shocked – because we said the exact same thing on pages 146-147: “Freshly picked ripened local produce is tastier than identical items shipped over long distances. No one—not even us!—will argue over that. The important issue here, though, is freshness, not ‘local’ character.” Of course, some local items will indeed be sub-par and end up as livestock feed or pie filling, but perhaps the true magic of locavorism is that some low-quality products are now sold at premium prices in farmers’ markets because customers think that imperfections and blemishes are an indicator of authenticity. 3. Creative destruction: Richardson acknowledges our basic point that all types of work will eventually become obsolete, but that specific activities should be pursued as long as they are profitable. She apparently dislikes large-scale monocultures because of their reliance on pesticides, but fails to acknowledge their higher yields which translate into more abundant and affordable food produced on less land. 5. Legal System: According to Richardson, because some bad things happen in less developed countries, we should ban all imports from these places… and in the process deny all poor farmers and workers access to more lucrative markets. We don’t see any (social) justice in this stance. The fact that Richardson’ straw man critique is taken seriously by prominent local food thinkers such as the University of Massachusetts’s John Gerber probably says a lot about the fragile intellectual foundations of the locavore movement. We concluded the preface to our book by inviting locavores “to let us know where [they] think we went wrong in matters of economic logic and factual arguments” and promised to answer their challenge. Our invitation still stands and we are more than willing to debate any open-minded critique as we proved in an exchange we had with Dr. Lenore Newman of the University of the Fraser Valley (British Columbia). So locavores, bring it on! * Article first published in MasterResource on August 10, 2012. 1. See Indur Goklany. 2007. The Improving State of the World: Why We’re Living Longer, Healthier, More Comfortable Lives on a Cleaner Planet. Cato Institute.